Big Hearts Little Hands Childcare and Early Learning Center mission is to provide a solid foundation that ensures your child will reach his or her full potential and is ready for school and ready for life. We treat children of all races, religions, family backgrounds, and cultures with equal respect and consideration. Big Hearts Little Hands’ nurturing and educational environment is the place where every child wants to play, learn, and grow! We provide developmentally appropriate activities for all children 6 weeks to 5 years old. Our curriculum is activity based and is designed to engage children early in the love for Science, Technology, Engineering, Arts, and Mathematics. We also follow the common core standards for Tennessee Early Learning Development and implement multicultural activities in our classrooms. Big Hearts Little Hands is open Monday through Friday from 5:30 a.m. -6:15 p.m. Saturday drop-in care will be provided based on the needs of our parents. There is an additional fee for this service. The center closes its doors promptly at 6:15 p.m.; late fees are $15.00 for the first 5 minutes and $1.00 for every minute after. The reason for the late fee is to ensure that the center closes at 6:15 p.m. The late fee should be paid in cash to the office, on or before the due date of the next tuition. Big Hearts Little Hands reserves the right to dismiss a child who is picked up late on a consistent basis. Big Hearts Little Hands Childcare and Early Learning Center does not discriminate against a child or parent on the basis of the race, color, national origin, religion, or disabilities in any of our policies, services, or practices. Big Hearts Little Hands and the State of Tennessee Department of Human Services requires all children enrolled have a current immunization record on file and physical if 3 years or younger before attending. Big Hearts Little Hands require all paper work including the Parent/ Provider contract and receipt of Policy agreement are signed and completed, before attending. If your child has any special needs, they must be addressed before enrolling to be certain that we are able to provide the appropriate level of care for your child. Big Hearts Little Hands does not discriminate against a child or parent on the basis of race, national origin, or disability in any of its’ policies services, or practices. Communication with our families is of the utmost importance. Infant, toddler, and preschool classrooms receive daily notes regarding their day. This information will include routine activities such as diapering, meals, and activities. In the event of an incident you may be contacted throughout the day via phone or email. Please check your child’s cubby each day for take home work and additional information. We also try to maintain a paperless environment and send some information that does not require a signature via email. Please try to keep the center current with any phone numbers or email addresses that may change during the course of the relationship. Big Hearts Little Hands opens its’ doors at 5:30 a.m. and we ask that all parents and children stay in their vehicles until the doors are unlocked, if they arrive earlier than 5:30 a.m. Please refrain from using your phone at the time of drop off and pick up, as this is a critical time for communication with your child’s teacher and child. Every child must be signed in daily and taken directly to their classroom. Every child must also be signed out daily, and will only be release to custodial parent or other person specifically authorized by the parent. This person must have valid identification and also be listed on the child’s transportation list and emergency contact form. Big Hearts Little Hands is required by law not release a child to anyone that is noticeably intoxicated or incapable of driving. If this was to take place an approved contact person would be called to pick up the child. Big Hearts Little Hands Childcare and Early Learning Center values and respects the privacy of our families regarding their child and family situation. All personal information will be handled in a respectful and confidential manner. A registration fee is due upon enrollment with Big Hearts Little Hands Childcare and Early Learning Center. This fee is non- refundable and ensures your child’s placement. The registration fee is due annually and is due every September. All tuition is payments are due weekly on Friday for the next following week. Tuition is due regardless of attendance or holidays. There will be $37 dollar returned check fee for every returned check. After two returned checks, checks will no longer be accepted. We require a two week written notice prior to your child’s withdrawal or you will be responsible for the two week tuition. Overdue accounts will be turned over to our attorney and fees may apply. Refunds for prepaid accounts, at the time of withdrawal will be at the discretion of the owner. The center will provide breakfast, lunch, and two snacks Monday through Friday. If you will like your child to receive breakfast please have them at the center prior to 8:30 a.m. No outside food is allowed in the center with the exception of food items for events held at the center. If there are certain items that your child may not eat or drink please make sure that this information is in your child’s file and that you have notified the teacher and director. Big Heart Little Hands will close if weather conditions are severe. This will be at the discretion of the director. The safety of our children and staff is very important to us. If we receive a bad snow storm or ice storm during operating hours, the severity of the weather will dictate our daily schedule. The center will close Christmas Eve at 1:30p.m. Please note if the holiday falls on a weekend, we will be closed the day before the holiday or the week day following the holiday. This will be at the discretion of the owner. Parents will be informed in advance of the closing date. When the center is closed for the holiday full tuition is still due. If the holiday falls on a Friday when tuition is due payment will be due at the time of drop on the next business day. 1. Notify the director of your intent. At this time the director will ask you to fill our withdrawal papers and your child will be placed on a waiting list for the upcoming fall school year. This waiting list is based on seniority. 2. Your child must be re-enrolled by the first day that the Public school system starts and a new registration fee must be paid to ensure your child will have a spot. Withdrawing from the center during school breaks and such as Christmas, spring, and fall break is discouraged. Please note: we are unable to hold spots. We must work together to ensure that the proper social values and learning skills are instilled in your child. There will be no physical punishment of any kind used at the center. Good discipline is not just enforcing rules; it is caring enough about children to provide clear guidelines for them to follow. Children who seem to be having trouble cooperating or following the rules of the center will be redirected in a positive manner. Short periods of time out may be used if the classroom teacher feels it is necessary. Parent conferences will be scheduled if behavioral problems persist. Your suggestions on how to correct any problems are welcome. It takes a village to raise a child. Biting is a sensitive issue. Each time a child bites, the bite is recorded. The bite will be rated on a scale of 1-3 points in accordance with the severity of the bite. The number of points allowed is based on developmental age and are at the discretion of management. Parents of both child who bites and the child who is bitten are contacted to inform them of the incident. If your child bites frequently, we may request parent conferences to help modify the behavior. The center may provide the family with resources on biting or request advice from the child’s pediatrician. The child may be placed on probation for one week if the behavior continues. Dismissal from the center may follow if the child continues to bite. 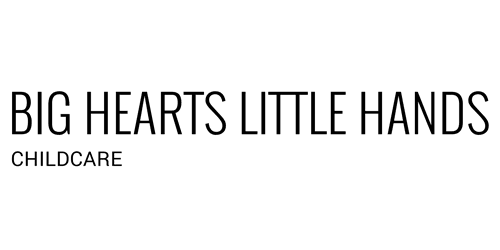 Big Hearts Little Hands has a one month trial period for any enrolled child. The center reserves the right to request the withdrawal of a child during the trial period if one or more of the following condition exits. 1. Child is not participating in or benefiting from the program. 2. Child is bullying another child after being redirected (3 strict policy). 3. There are no reasonable accommodations the center can make to provide adequate or safe care for the child. Big Heats Little Hands will provide a written notice if we determine it is necessary to dismiss your child. Big Hearts Little Hands Childcare and Early Learning Center serves children with special needs and disabilities whenever possible. Any eligible applicant with special needs or disabilities will be enrolled in the program if, after a careful evaluation of the child’s care needs and Big Hearts Little Hands capabilities to meet those needs. If it is felt that the child can participate in and benefit from the services Big Hearts Little Hands will make reasonable accommodations to provide safe care to this child as well as to the other enrolled children. Big Hearts Little Hands will require the individual support plan or individual education plan to be kept on file. Big Hearts Little Hands will be part of the evaluation process and provide necessary developmental information to professionals working with your child. If Big Hearts Little Hands feels that your child may need special services, we will meet with you privately to discuss our concerns. We will provide you with local programs that may be of assistance in determining a developmental delay or special need. We strive to maintain a clean and safe environment for the children. The State of Tennessee Department of Human Services requires all children enrolled have a current immunization record on file and it must be signed or stamped by a physician or health care agency. A physical is required for children 3 years or younger before attending. Infants must have on file an official health record of the first medical checkup at eight weeks of age. Upon arrival all children’s hands must be washed and will be checked for any communicable diseases as required by the State of Tennessee Department of Human Services. Children with a fever or contagious illness may not be brought to the center. Teachers are responsible for reporting any signs of communicable disease immediately. Symptomatic children shall be removed from the group until parents are contacted and health issues are resolved. These symptoms maybe but not limited to a fever of 101 or above, diarrhea, or vomiting. Parents have one hour to pick up their child. Parents must bring a signed doctor’s note stating that the child is not contagious. Please note that even if a child does not exhibit any of the symptoms that are mentioned above, but are still unable to participate within the group due to not feeling well, you maybe asked to pick them up for the day. In the event that your child requires immediate medical attention, we will first call 911 and parents will then, be contacted and informed of the situation and their child’s condition. All children shall have on file permission granting Big Hearts Little Hands staff to seek emergency care if necessary. Medications prescribed by a doctor are permitted at the center. This only includes Epi pens and inhalers. All other medications must be administered by parents or authorized persons. Under no circumstances may medication be kept in diaper bags, backpacks, or in the classroom for any reason. Definition of Child Abuse: improper treatment that can harm a child physically, sexually, emotionally, and/ or mentally. Big Hearts Little Hands’ staff is required by law to report any suspected abuse of neglect to the Department of Children’s Services. Staff may not attempt to investigate or determine the validity of abuse. All staff members receive extensive training on the subject of child abuse throughout the year. Parents are welcome to attend child abuse training offered by Big Hearts Little Hands as well. Child care facilities licensed through the state of Tennessee are required to incorporate a state approved personal safety program into the curriculum. Keeping Kid’s Safe, the program used by Big Hearts Little Hands is an age appropriate curriculum using short stories and to convey safety topics that pertain to preschoolers, including stranger danger and safe touches. Parents are provided an opportunity each year to meet with management to view the curriculum and ask questions regarding this sensitive subject. Department of Human Services licensing regulations have specific criteria for child care agency that must be meet and followed in regarding SIDS PREVENTION, Each child must have his or her own crib and no blankets of any kind other than a fitted sheet is allowed in or on the crib. The crib must also be free of hanging objects and toys. All infants must always be placed on their back to sleep and must be touched every 15 minutes. If your child is required to sleep on his/her tummy or side at any time it must be documented by a physician and placed on file in our office. Smoking is prohibited on Big Hearts Little Hands property. Licensing stated that smoking should not be permitted in the presence of children. This includes the parking lot. Please refrain from smoking during drop off and pick up. State licensing and Big Hearts Little Hands do not permit under any circumstance Firearms on the premises of the child care agency. Corporal punishment is not permitted on Big Hearts Little Hands property. Big Hearts Little Hands Childcare and Early Learning Center must follow state standards for diapering. Diapering standards require that children be changed with a certain time frame and that we use adequate supplies. Please take note that we may use more diapers than you do at home due to these standards. Universal precautions, such as the use of gloves and proper hand washing techniques, are maintained to ensure that sanitary conditions are met. Big Hearts Little Hands will begin the potty training process when the child is showing signs of readiness. We do understand that children do not potty train at the exact same time. We will positively encourage your child to go to the restroom. During this time, please be sure that you have provided all of the requested items on the supply list such as pull ups, training pants that are leak proof, and extra clothing. Parents are welcome to enter the facility at any time during operating hours. We feel that your participation and involvement in parent conferences, parent council meetings, open houses and center functions is very important for you and your child. Volunteers add in the quality of our program and we encourage parents to volunteer in the classroom for special projects and parties. Quality students from area high schools and colleges may volunteer as party of their course work; however they do not count in the child to teacher ratio and may never be left alone with a child. Volunteers are only used to enhance the curriculum and provide and additional set of hands for fun activities.